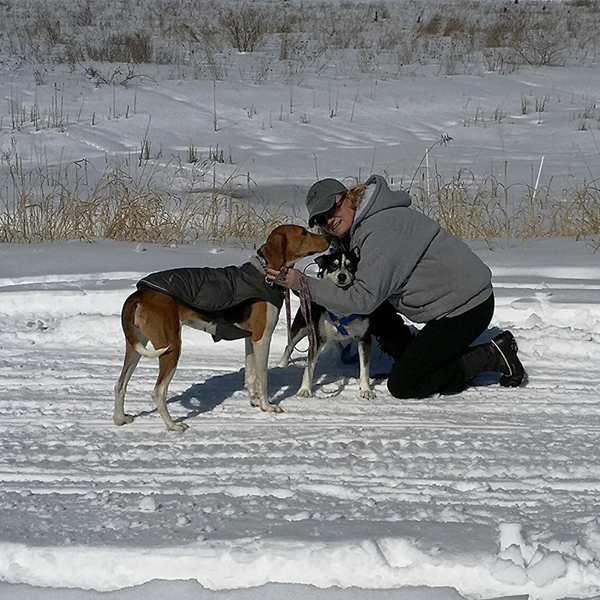 Since we had a blanket of snow and ice on the ground for the last two weeks, I was very surprised to find ticks on our dogs when we returned from a recent hike. It was a sunny day and the temperatures had gone above freezing. According to Cornell University experts, the persistent snow cover helps insulate overwintering ticks in the leaf litter. Once temperatures go above freezing these ticks become active and attach themselves to unsuspecting hosts. Really, the bottom line is that every season is tick season in New York State. High local deer populations have contributed to a rise in reported Lyme disease cases in people and pets in New York State and the surrounding areas, according to Cornell University. My husband and I were both bitten by infected ticks last year and had to be treated with antibiotics. Now, we’ve become experts at spotting those tiny black specks on our dogs’ legs during hikes in the woods. There are always some of those pesky ticks that escape our notice. Usually, they are hiding behind the dogs’ ears or have already embedded into the skin on their necks. These we find later either dead on our floors – thanks to flea and tick preventative – or crawling between the bristles of a grooming brush. Veterinary experts at the Companion Animal Parasite Council (CAPC), advise pet owners to apply flea and tick preventative year-round. Our veterinarian recommends year-round broad spectrum parasite control to protect against heartworm, intestinal parasites, fleas, ticks, and the control of parasites that are zoonotic (spread disease between animals and people). 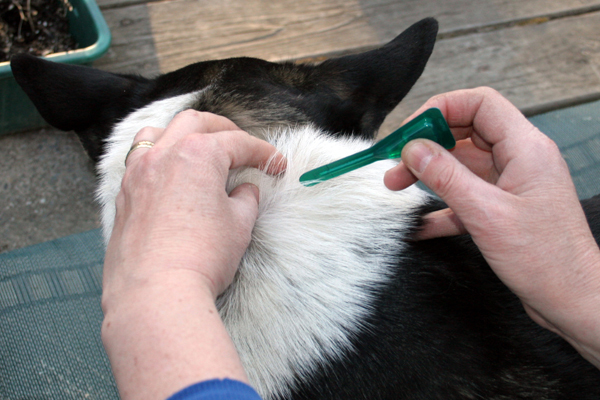 It’s important to understand that fleas and ticks are more than just a nuisance. These parasites can actually cause severe health problems to pets and human family members. Tick-borne diseases are bacterial diseases that can be spread to animals and humans through infected ticks. Ticks and the threat of vector-borne diseases are not just a concern for those of us who hike in the woods. Neighborhood parks, jogging and hiking trails, and dog parks all pose the threat of tick infestation. Some veterinarians even recommend protecting indoor cats against parasites. Especially cats who share a home with dogs because dogs can bring the parasites into the home. Cats are prone to ingesting fleas during grooming and can develop a subsequent tapeworm infestation as well. Applying the flea and tick preventative is easy – choosing from the huge number of products on the market today is a more daunting task. It’s important for pet owners to consult their veterinarian as each pet needs to be evaluated individually. The best product to use is based on a pet’s species, age, health, risk of exposure, and lifestyle. Wear light-colored clothing with long pants and sleeves. Tuck your pants into your socks, and your shirt into your pants. Use spray repellents as directed on the label. Walk along the center of trails and avoid contact with shrubs or brush. Conduct frequent clothing checks, and carefully inspect your body for ticks. Once home, dry clothing on the highest temperature setting for 10 minutes to kill any ticks. Keep pets from tick-infested areas and check them before entering the house. Mow lawns and remove lawn debris and leaf litter. Discourage rodents by reducing cover (e.g., wood piles) and food sources (e.g., bird seed, compost). Move lawn furniture and children’s toys away from the yard edges and wooded areas.